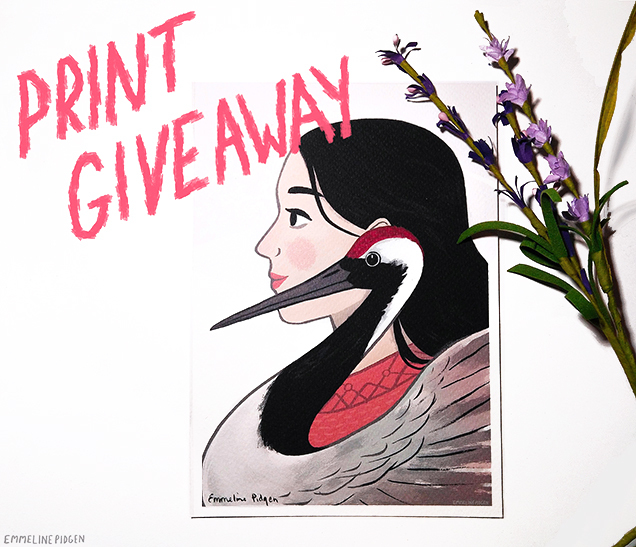 Emmeline Illustration: Emmeline's January Print Giveaway! It's been a while since I've hosted a giveaway on my blog, and after just realising I pipped 5000 followers on Tumblr last week, I thought it was high time I give back with a little print giveaway! This week I'm giving away this little number from my newest series of prints! 'The Crane' is a hand-signed high quality art print on slightly textured 300gsm acid-free white watercolour paper stock. A5 size (148mm x 210mm). So this will be the first giveaway I've done since having my Instagram account, so I'm going to give it cross-platform entry - so pop over to follow the instructions on my posts on Twitter, Instagram, or leave a comment on this blog post to enter. Get your entries in by 11am February 1st (GMT) to be in with a shot! The competition is open worldwide, and one winner will be randomly selected from all entries on Twitter, Instagram and this blog post (max one entry per person on each platform, so total 3 entries possible per person). Competition closes at 11am on February 1st (GMT). The winner will be contacted via the platform they entered on and announced on this blog on February 1st! If the winner does not respond within one week, a new winner may be picked. Remember you can follow me on Twitter, Instagram, Tumblr, Facebook or via Bloglovin'!